At the Young Centre for the Performing Arts, Toronto, Ont. The Story. Jay Jackson is a black boxer jabbing his way in fights with other black boxers and winning through smarts, skill and strength. But he wants more. He wants to break the colour barrier. He wants to fight the best white boxer, the heavy-weight champion of the world who is retired. An offer is made. The terms are lousy for Jay but he takes it. He wants his picture on page one in the newspapers not page six where blacks are usually placed. He wants his place at the top of the boxing game. And he wants to win for another reason, more personal and certainly a more sobering reason. His sister Nina doesn’t want him to fight because the cost to their family is too great. “Let someone else do it,” she says. 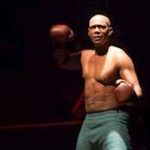 The story of Jay Jackson, a black boxer, wanting to fight the retired heavyweight champion of the world, who is white, echoes the story of Jack Johnson who fought Jim Jeffries in 1910. The hopes and dreams of blacks rest on Jay winning. But the cost to him and his family is enormous. The Production. Guillermo Verdecchia has directed a production that is muscular, nuanced, detailed and simply thrilling. Thrilling! Designer Ken MacKenzie has one side of a boxing ring upstage centre. We imagine the other three sides. Two poles, one stage left and one stage right, hold the three ropes of the ring side. Behind that are chairs in front of the back wall of the theatre. When characters are not in a scene, they sit in the chairs and watch the action. Audience members can sit on the stage at the extreme stage left and right sides of the theatre. Personally I would think that while the audience is close they get a skewered view of the action. Jay Jackson (Dion Johnstone) and his main opponent Fish (Christef Desir) jab, punch, parry, weave, bob and engage in aggressive fighting, and they never land a punch against each other’s body. Simon Fon, the production’s gifted fight director has created/choreographed the fights of each of the six scenes that grow more and more aggressive. Both Jay and Fish stand about 10 feet away from each other, facing the audience. Each man jabs his gloved fists forward as if facing his opponent. The other man might back away, or if a punch ‘lands’ the head of the receiver snaps back suggesting contact. Dion Johnstone’s head snaps are subtle suggesting Jay Jackson could take a punch to the head and recover quickly. As Fish, Christef Desir stumbles when he receives Jackson’s hammer-fist in the head. When Jackson gets going his punches are relentless, made all the more brutal because the audience’s imagination is doing all the work and creating the fight for real. The beauty and power of wonderful theatre. Guillermo Verdecchia illuminates the percussive nature of playwright Marco Ramirez’s dialogue by having the boxers bang their gloves together in a trio of punches; or they punch themselves in the chest; or others clap their hands or stamp their feet in a concise formation. The rhythm is there, like a drumbeat. It’s seductive and gives warning. Dion Johnstone plays Jay with a sheen of elegance, drive, laser focus and a determination that is breathtaking. Jay is a man with confidence and smarts on how the world works and what he needs to do to get noticed and still be true to himself. The cast is superb. Diego Matamoros plays Max, the only white character in the play. He is Jay’s manager of sorts; he organizes the bouts. Matamoros has that harried, hunch-back look of a man on the run, trying to do right by his fighter but knowing he chances are limited. He arranges the fight with the retired white heavy-weight champion of the world but doesn’t seem to have pushed too hard for better terms. Interestingly it’s Max who is small time while it’s Jay who has the class of a champion. I am puzzled at Verdecchia’s penchant for having Matamoros squat down frequently to talk to Jay. I can’t recall if these squats are when Jay is sitting and so Max squats so as not to “look down” on Jay. Still it looked odd. As Fish, Christef Desir is skittish, like a man who has dreams of beating the best, but not quite the experience yet. Fish has sweetness and a skill that Jay finds refreshing so even though Jay beat him in their fight, Jay hires Fish to be his sparing partner because of his determination. Every champ needs a person to support and urge them on and for Jay that would be Wynton his trainer and corner man. Alexander Thomas plays him as a slow walking, slow talking man who’s worked in the fight game a long time and knows a thing or two. Perhaps Jay’s biggest opponent is his sister Nina. As played by the wonderful Sabryn Rock Nina is straight-backed and proud. There is such watchful detail in this performance. (praise the actor? The director? Both? ) At one point Nina takes off her jacket and is about to hang it on one of the ring posts, but first she carefully draws her finger along the top to check and see if it’s clean. Then she drapes her jacket over it. That kind of fastidiousness speaks such volumes about Nina. She is trying to raise two respectable young sons but it’s difficult when your brother is a boxer revered by their black community who consider Ray their hope. They spare. They jab. In a way the last scene is the most combative with the highest stakes. That Marco Ramirez has invested the scene with a double whammy packs a punch that leaves you winded. Comment. Playwright Marco Ramirez has written a gripping play of ambition, racism pride and the need for a place in the world to be respected for who you are, equally with everybody else. The play poses so many questions: If you have the ability to lift yourself and your community up from being an afterthought would you take every opportunity to do it, no matter how big the risk? If you or your family are threatened, do you walk away? Do you leave it to others to make the point? When the deal is lousy and you know you are being treated with disrespect, do you take the deal because you feel you can win and command respect? I love the questions. What a thorny, moving, deeply imagined play. How lucky we are to see such a splendid production of it. I asked “How come you’re going to that theatre?” I asked because he didn’t seem familiar with the name. “My son is directing,” he said. “Guillermo Verdecchia,” he said quietly, with pride. As we walked Mr. Verdecchia talked of the stressful drive in from Kitchener. He left at 4:30 pm and now it was 7:15 pm and he worried about parking and finding the place. But all was ok.
Mr. Verdecchia had his own story. When he came to this country he was looking for work and got a job. His boss asked his name. He said: “Raphael (sp?) Verdecchia.” The boss tried hard to pronounce “Raphael” but couldn’t get his tongue around the music of that name so he asked “Can I just call you Ralph.” And Mr. Verdecchia said sure. (I liked that the boss asked first). So for his whole working life he was known as “Ralph” at work. But when he retired he insisted he be known as Raphael to everybody. Then we arrived at the theatre. I shook his hand and left to get my tickets and he to meet his granddaughter. And we both went to see a play directed by his gifted son, Guillermo, about a black man who just wanted respect and a place in the white man’s world. Guillermo Verdecchia just wanted to be called by his name of Guillermo. Raphael Verdecchia wanted to be called by his own name of Raphael. Jay Jackson wanted to be respected for who he was and what he accomplished. In a way all three are the same story–they were all treated as ‘other’ and they wanted to be treated equally. Running Time: 90 gripping minutes.